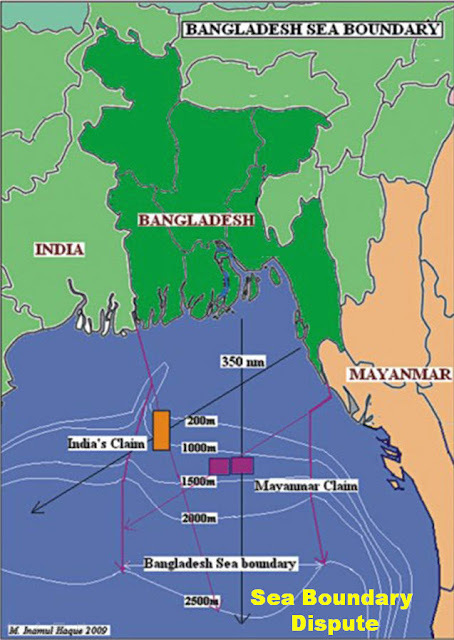 An outcome on the dispute over maritime border between Burma and Bangladesh will come out in a couple of months. The dispute originated from the locations of natural gas reserves offshore at kyaukphu, Arakan State, acclaimed by Burma, actually by Burmese military regime. Arakanese and elsewhere inside Burma were unpleasant about Burmese government’s deal of piping away the natural gas and oil from Arakan offshore to China. So-called the Shwe Gas Project benefits China and Sr. Gen Than Shwe; not for Burma and starving people of Burma. Chinese have already moved into Kyaukpyu. Military has built up its forces at Ann. For paving gas pipeline corridor at the Chinese border, military has, now, been waging war against Kachins who were living there for their whole lives. Therefore, this presentation of Part III of “If.. No Fly Zone over Burma” begins with Burma’s latest air force base at Ann. Arakans have heard of massive Burma’s military built up on the Arakan Yoma (Ranges) at Ann, but that whole area has been restricted to civilians. 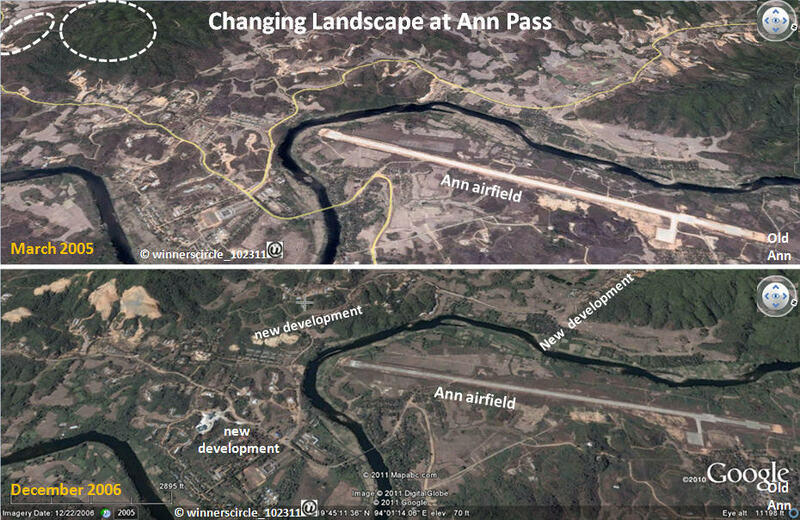 Ann airport was upgraded to Burma’s latest air force base, as reported by http://photayokeking.org/. The changes in the landscape in and around Ann (town and airfield) can be seen by comparing 2005 and 2006 satellite photos posted on Google Earth™. Note the circles in 2005 with no excavation on the slope of the hills. The Burmese Western Military Command and Control Headquarters have been moved out from Sittwe (Akyab) to Ann. (A) Military establishments have been further extended to the south of airfield and the original Ann town. 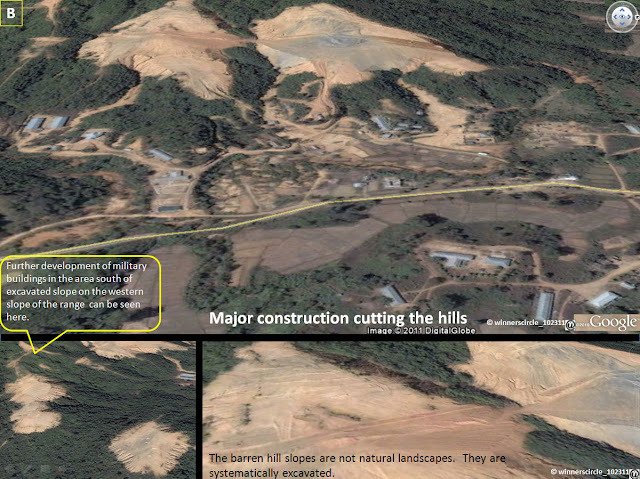 (B) On 2006 photo, hill slopes at two large hills had been excavated. Expansion of the establishments extended further south. 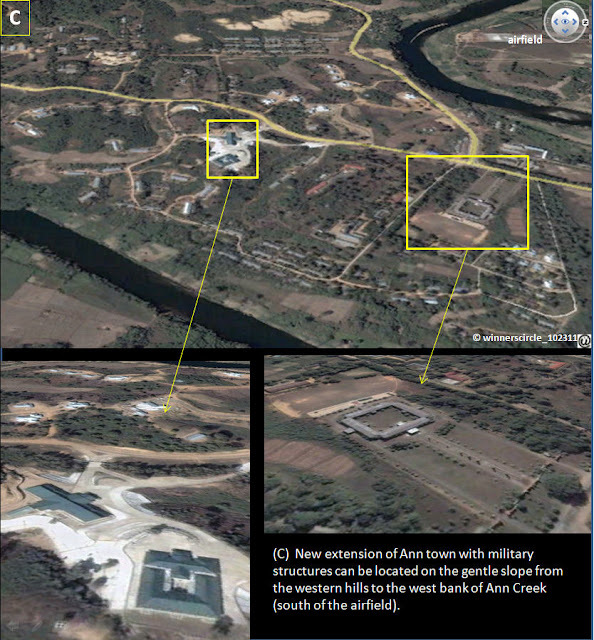 (C) Extended area from the hills to the west bank of Ann creek has been potted with standard military structures with blue colored roofs. (D) Original Ann airport was upgraded with longer runway and new tarmac. The 2006 satellite photo was limited to see possible aircraft hangers, new taxi-ways, etc. (E) Total population of original Ann town was 1,000. The town is spreading along the east bank of Ann Creek. The new military installations have been developed south and northeast of the old town. In http://en.wikipedia.or/wild/Ann_Township, it noted that "Ann Creek" Hydropower Project is being implemented by the Ministry of Electric Power No. 1 on Ann Creek, 3.5 miles northeast to Ann. The project can generate 44 million kilowatt hours yearly when it is finished. (F) Just on the western side of the hill across from the air base, more military installations have been establishing. (G) The same way, more military installations have been developed on the east of original Ann town. So, why has the Burmese military built up at Ann location then? (A) The simplest reason is to keep nationalistic Arakanese (Rakhines) people under tight control of military powers. At the lowest level, looting land and properties in rural areas abusing Naypyitaw directions. Arakanese are faced with land confiscation without compensation; destruction of ancient cities, national heritage and Arakanese pride, for railroad construction; harass and arrest of individuals who express personal political belief. To the extent, it is to thwart quickly any popular uprising in the future. (B) Militarily, this is the seat of control and command center to engage in ethnic armed-resistance such as Arakan Liberation Party (ALP) and Chin National Front (CNF) activities effectively. 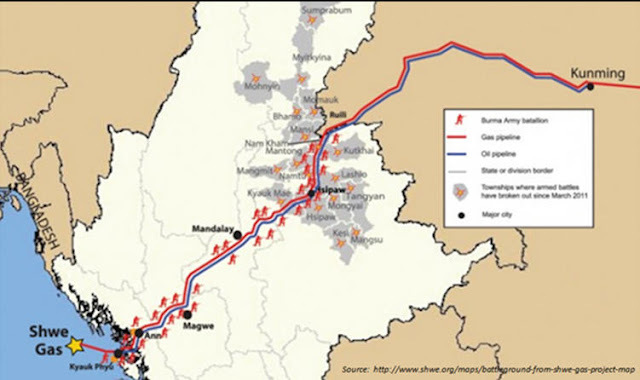 Just looking at the planned route (corridor) of gas and oil pipelines (See below) of Shwe Gas Project, and its associated plan for a rail road, Burma will be divided diagonally into two states with a corridor from Ruili (Chinese border) to Kyaukpyu (Arakan coast). For a national security reason alone, no other government would usher a neighboring country who would grab every resource to feed its exploding population, into its own land. 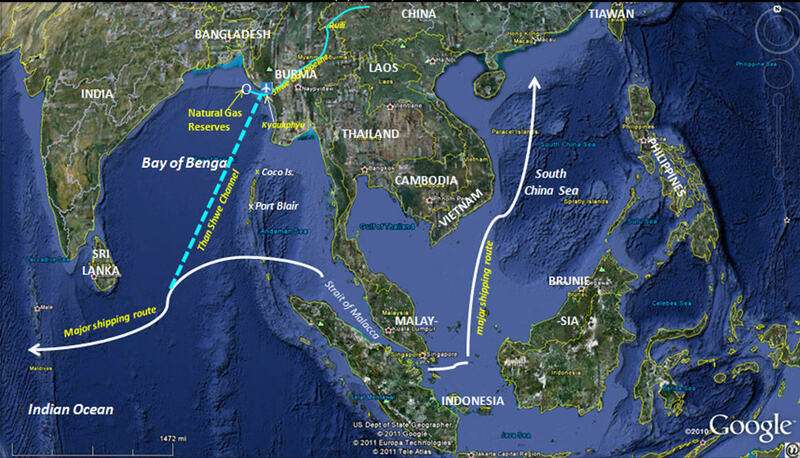 But brilliantly, Than Shwe’s offered a flow of gas and oil to China as well as bringing back into Burma with a flow of population, machines, materials, money and military forces along this corridor. Officially, the whole deal with China was Than Shwe’s personal interest; not merely any benefits for the nation. Thus, it’s been named as “(Than) Shwe Gas Project”. Now, Than Shwe’s streamlined with current Burmese government who he has selected/elected, to wipe out Kachins who’ve lived there forever at the Chinese border region where the pipelines will be laid. What a shame! At Than Shwe’s command, current Burmese government and military is waging a war against Kachins, its own national ethnic minority for the Chinese favor. It is also evident in Kyauklpyu, the Burmese government and military is assisting in land confiscations for Chinese who came to work for (Than) Shwe Gas Project. One of the main reasons for military built up at Ann is for (Than) Shwe Gas Project too. The military will use force as necessary to put the pipeline corridor in place through the Ann Pass, and making sure of what Chinese needed in Kyaukphyu. As for all nationalities of Burma, present killings in Kachin hills, and land confiscations in Kyaukpyu (Arkan) cannot be considered as isolated local issues. It is a national issue, no less serious than Myitson Dam issue. It’s time to rise up to scrap the (Than) Shwe Gas Project. If the people of Burma would let go of this (Than) Shwe Gas Project by the government now, the next generations of Burma will become Chinese, and Burma will most likely become a province of the Republic of China. Most chillingly, Chinese-Burma children in the next generations will be paying homage to Than Shwe’s statue as one of the loyal warriors of China in Beijing’s Tienanmen Square.